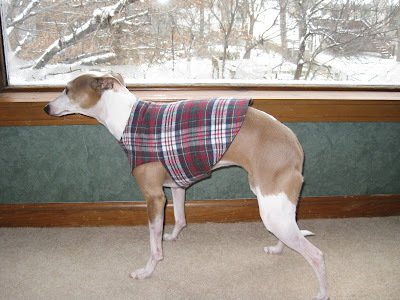 There is a free dog coat pattern over at Circle of Crafters. It works best if you have a small dog, as the pattern is one you print out. I'm guessing you could resize it for larger dogs on a photocopier using big paper. 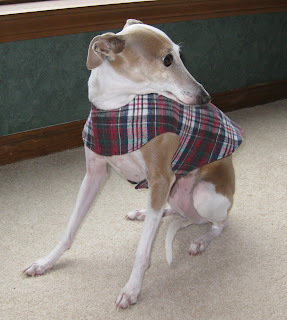 I used a layer of plaid flannel and a lining of brown flannel. The result is warm, but not bulky. I also added top stiching that wasn't part of the instructions, but it made the coat look more finished. My dog isn't a fan of the coat, but she hates any kind of clothing. I like the velcro closure, so it can be easily taken off (by you, but not by the dog!). 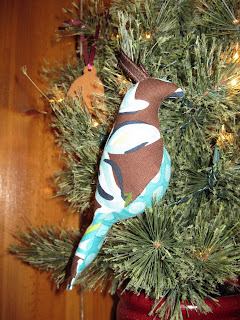 These fabric bird ornaments are quick, handmade gifts for some of the special people on my list. 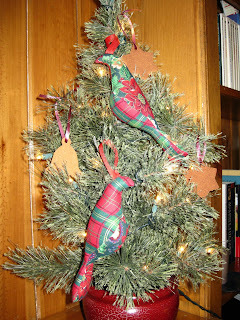 I was inspired to make them by this blog. 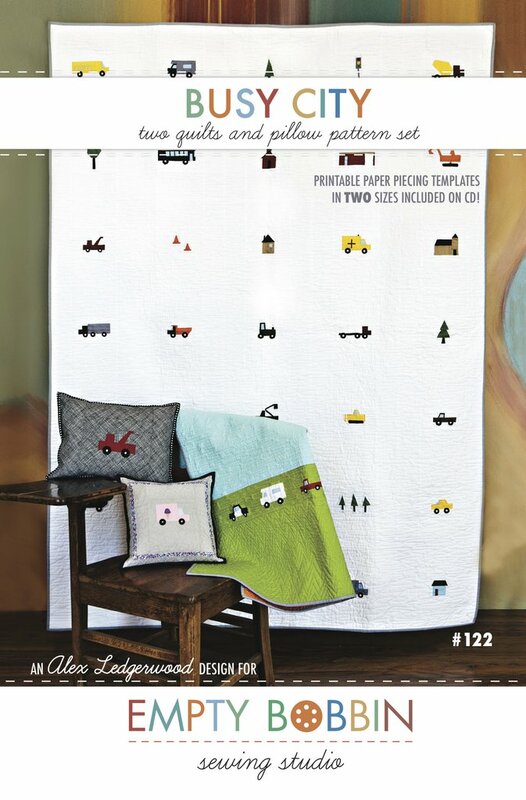 You can find a free pattern here at Spool Sewing and make some of your own. 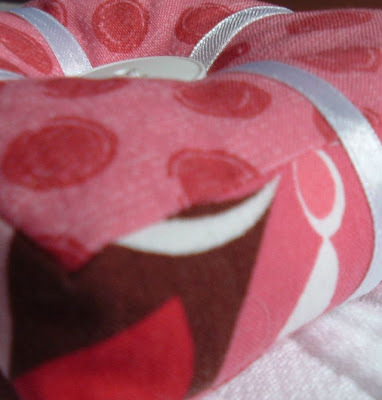 You can try out a variety of fabric combinations like I did. Baba! Congrats. 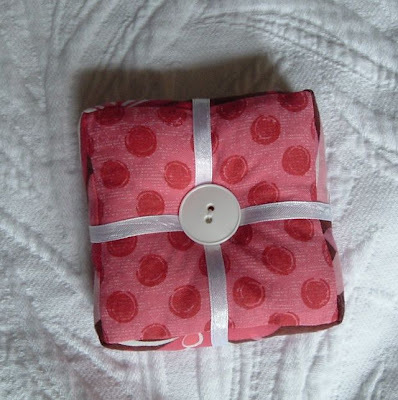 I'll send the pincushion out to you soon! Thanks to everyone for your kind comments. I hope you'll be back to my blog and checkout my etsy store too. I'm going to be adding things to it in the next few months, before our new baby comes home! Here's my free give away item! 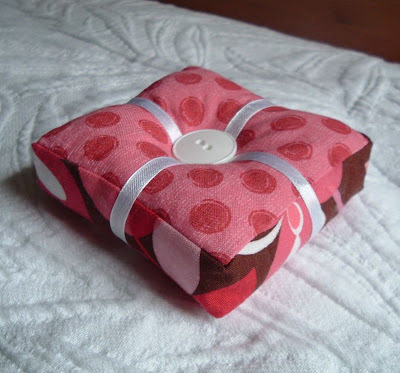 Leave a comment, and I'll pick one person at random to receive this cute, handmade pincushion. 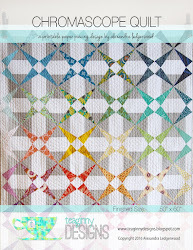 It is made from Heather Bailey's pattern, and is about 4 to 5 inches square by 1 to 2 inches high. 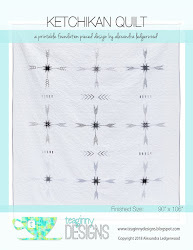 It'll add a lot of personality and color to your sewing table, or give it to your favorite seamstress! Sorry, I can't ship internationally, but I will ship for free to those in the lower 48. I'll post the winner on December 4th. One of my favorite websites is hosting a fun give away tomorrow. 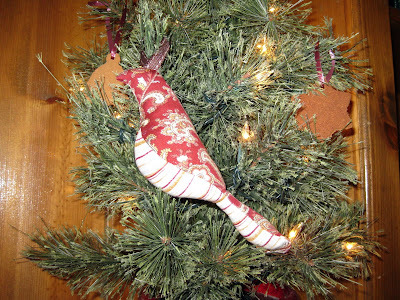 Check it out for a huge list of blogs offering a chance at free, handmade items for one day only. I know I'll be looking. Look here first thing in the morning for your chance at a free something, handmade by yours truly. I'll even ship it free!